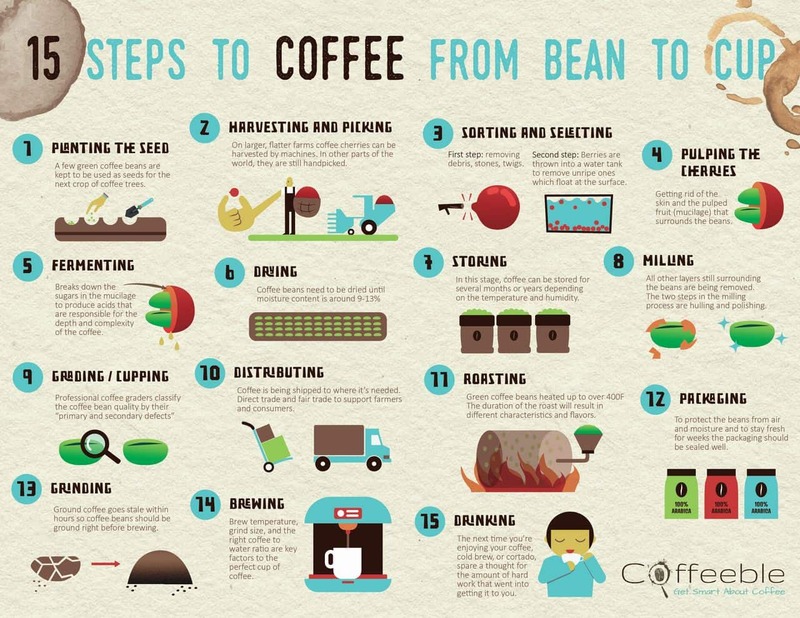 Our friend, Thomas from Coffeeble.com, created this great infographic and webpage titled, "How Is Coffee Grown: 15 Steps To Coffee From Bean To Cup." For many of us, coffee is one of those life necessities and splendors we just can’t live without. Some people cannot even picture starting their day without a nice warm cup of coffee. And don’t forget about that mid-day slump when coffee is what gets us through the rest of the day. Sounds familiar, doesn’t it? If you love coffee, have you ever stopped to wonder how coffee is made? Many people imagine coffee beans growing on a plant but what they don’t know is that coffee doesn’t start in the form of a bean at all. A coffee bean is actually a seed that comes from a specific type of berries. Therefore, we can say that coffee beans actually come from a fruit! Coffee berries usually contain beans that are split in two. However, in around 5% of the beans harvested it can happen that a bean doesn’t split and this type of a coffee bean is popularly called Peaberry since its shape resembles a pea. When it comes to length of the whole production process, a coffee tree can take up to five years to produce its precious fruit and it cannot grow in every climate. In order to produce a good harvest, a coffee tree will require special care with the attention to soil. The climate where this type of tree can grow is typically a warm climate of subtropical regions and equatorial regions. The berries are typically harvested by a machine or picked by hand. In order to get the beans out, the fruit of the berry needs to be removed and after that the beans need to be processed. There are only two known ways of processing coffee beans - dry processing, which is an older technique and wet processing, which is a more modern technique. Dry processing is the oldest method of processing coffee beans. The beans are placed in the sun and left to dry for around two weeks while being turned from time to time so they can dry evenly. Wet processing is a modern method of processing coffee beans and it takes place soon after the harvest. This process consists of bean washing and bean fermentation. During this process the pulp that is left on the beans will become softer and the pulp be rinsed off. Today, this method of processing coffee beans is used more frequently since it prevents damage to the beans. When the processing is done, the beans are sorted. All of the bad beans are thrown out and the good ones are put in bags and shipped. At this point they are called “green coffee beans.” However, it isn’t all done yet. Now comes the final part - roasting! Roasting is essential and the final step in coffee production. It requires the perfect timing and setting of temperature to provide the perfect product. While the beans roast, they will split and their coating will be released. How strong the coffee’s flavor is depends greatly on the bean roasting formula. For example, the longer the beans roast the more intense the flavor will be. Ironically, it is assumed the stronger the flavor, the more caffeine. However it is actually the opposite which is true. The longer the coffee beans roast, the more the chemical, caffeine, is removed. You can buy your beans already roasted, but for the freshest experience, many people prefer to roast their own beans at home. Keep in mind the name of a line of coffee beans, such as Breakfast Blend, can differ from one company to another. This is due because many use different roasting temperatures and times prepare a particular batch. Roasting beans even for a few minutes longer or shorter can alter the flavor of the entire batch. Once the roasting is completed for a batch of beans the finished product is shipped to a retailer or sold directly to the consumer. Coffee beans are shipped all around the world from Africa to Italy or Canada and the United States or Mexico. Everyone serves their coffee in various ways. In Italy it is more common to make shots of espresso using their stovetop espresso maker. While in the United States many people brew their coffee in coffee pots. No matter which method you use, making coffee is more than just the final brewing process. It is a lengthy process which starts as a simple coffee berry and eventually finds its final destination in the cups of coffee consumers all around the world. Author Bio: Elizabeth Krause is an avid coffee lover who publishes her own website featuring Italian food recipes for the public to use. She remembers her first cup of coffee as an initiation into adulthood and has never stopped drinking coffee since. She enjoys spending her time preparing good Italian dishes and enjoys dressing up the table to accent the type of food she prepares. For example, she serves her pasta dishes using her pasta bowls sets, or serves her Italian tomato salad in an Italian salad bowl. She enjoys writing about food and has found it to be a wonderfully relaxing and satisfying hobby.